The accomodations are offered in a historical building, internally restructured to offer all comforts. The guesthouse includes four suites, each having own kitchen, private bathroom and bedrooms. The windows overlook the wooded park and garden. Since 1986 the estate of Castello di Barbarano opened its gates to all guests who desired a different kind of vacation offering tranquillity and beauty in an environment of historical past and art. Absolutely stunning place. Quiet and beautiful view. We booked the rooms at the Marinoni family just a few days before actually arriving. Michelangelo was very quick and detailed with his answers. Although we arrived around 2 hours later than planned the welcoming was warm and prompt. We also got breakfast (fruit, coffee, bread, tea etc) for our first morning which was great. The Castello winery is a beautiful piece of paradise, nestled atop a sleepy village and beautiful vineyards spread out like a giant quilt. he gardens are large and it is a great place to unwind. The rooms are large and airy, compared to what we have grown used to in a b&b, and Elda was a great and helpful host who showed us all that we needed to know with efficiency and grace. Stunning location! We loved our stay in the small town of Barbarano. The host was fantastic and helped us many times. Hopefully we can visit Barbarano again one day. We (my girlfriend and my 1-year old boy) had a wonderful stay at this beautiful and unique estate. We planned for a trip in quiet surroundings with the possibility to go on "adventures". We found that Il Castello in Barbarano Vicentino was the perfect place for this. We spend 14 days here with day trips to Verona, Venezia, Vicenza, Padova, Montagnana and Este. The rest of the time we spend relaxing and playing with our boy in the garden, enjoying the panoramic view and cooking Italian dinners with local ingredients. We got what we came for. Tranquility, cultural experiences and time with the family. Hopefully we will return sometime in the future. The Castello is a magic property with a beautiful well kept old lemon garden. We were received by Elda, Michelangelo mother who show us the property and our apartment that was clean and comfortable with great views to the garden. Excellent location to visit by car for the day Vicenza, Verona, Mantova and Padova. Also a day trip to Venice is possible Highly recommended property with a fabulous host that took care to have everything working, including buying a new hair dryer for my wife. Le domaine est vraiment magnifique, c'est l'Italie de carte postale avec les vieilles pierres, le jardin en terrasse avec vue etc... L'appartement est très bien tenu et la famille de Michelangelo très gentille. Merci pour ce séjour. We spent a week at Castello di Barbarano. 10 people all together. this agriturismo is perfect for large groups of family or friends as it is very private and the self catering facilities are excellent. there are four apartments in one big house. we cooked all of own food which was great as we had many children in our group. we used the clothes washer too ! the view around the entire house is breathtaking. the town of Barbarano Vicentino is quaint and sweet. great caffe and bar in the small piazza (only a 5 minute walk from the villa). supermarket 5 minute drive away. and don't miss the dairy farm with the cheese shop in Punto Di Barbarano - 10 minute drive. WOW! and of course, our wonderful host, Elda. who welcomed us so graciously. she was there when we needed her and allowed us our privacy as well. I would go back to Castello di Barbarano for a holiday and time! 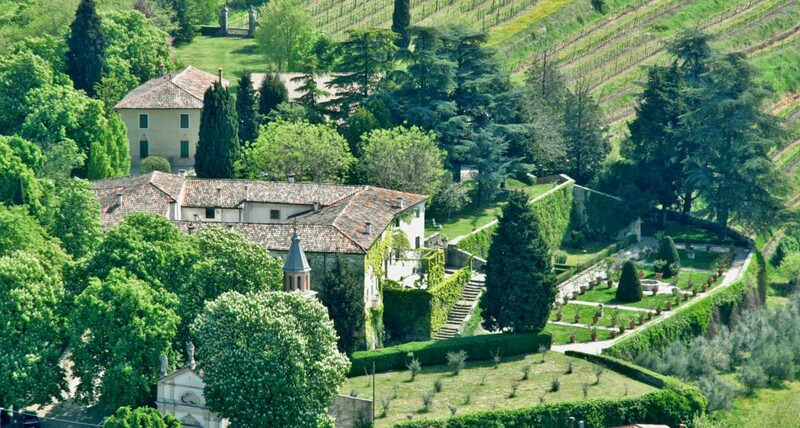 My husband and I recently stayed at Il Castello Barbarano for 15 nights. We had a fantastic experience. Elda and family were extremely helpful with local knowledge about day trips, restaurants etc. Nothing was a problem. Elda was a wonderful hostess. We enjoyed the beautiful grounds, historic garden, and scenery in a relaxed atmosphere. Our apartment was adequately furnished and the Kitchen was well appointed. We enjoyed our stay and would recommend Il Castello Barbarano to all. The location is central for visits to many towns in the Northern Italian Veneto area from Venice through to Verona and even south to Ferrara. We will certainly be staying there on our next trip from Australia. Mother Elda and her children Michelangelo and Maddalena, are welcoming guests from all over the world since 1986. Don't be afraid to ask: they are more than happy to show you the beauties of the territory, ranging from past architecture, sports, music and local delicacies.